15 minutes play...BumbleBeans Inc.: Lori's Intent! 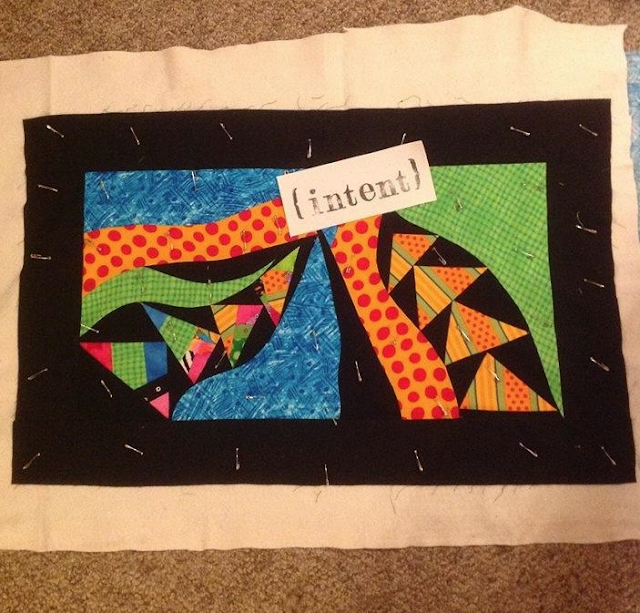 Just wanted to share my word quilt with you…INTENT! This was PURE play, as in no plan, no idea where I was headed next, just playing. I usually start with some idea, although my idea often gets derailed, but how much more fun it was this way! Truly, it will need some serious quilting, it's not exactly show-quality. Anyway, just wanted to share. Have a great day! Your shapes all suggest movement and direction. And your cheery colors 'say' play. Very successful rendering of your word INTENT! Thank you, all. It was such fun! Great shapes, movement and colors! Great that intent happens through play!